The Liberty Head Dime of A.A. Weinman, more commonly called the Mercury Dime, made its debut in 1916. The Philadelphia and San Francisco Mints cranked up their coining presses to strike millions and millions of the new dime, whereas the branch in Denver was concentrating on the Barber Quarter for most of the year. The Denver Mint finally got started making the 1916-D Mercury Dime, but only got 264,000 out before word came on November 24, 1916 to reallocate resources toward the production of 1917-D Standing Liberty Quarters. This explains why so many of us have an empty slot in our Mercury Dime albums where the 1916-D is supposed to go. The 1916-D Mercury Dime is the only date with a mintage under one million, and is the kingpin key date of the entire series. Be careful! There are many alterations out there, where a "D" mint mark was surreptitiously affixed to a common 1916 dime from the Philadelphia Mint (which of course, had no mint mark). The 1916-D is a classic rarity recognized by many coin collectors. 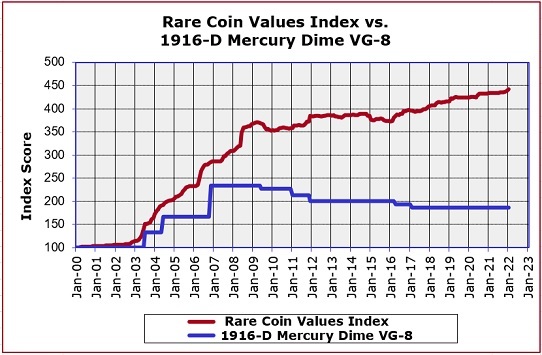 However, many of those same collectors might be surprised to see that the 1916-D Mercury Dime actually rates below the average of our Rare Coin Values Index, which takes the composite percent change since Year 2000 of a cross-section of 87 rare US coins. The idea of the Index is to estimate the strength and direction of the overall rare US coin market. The blue line above represents the percent change since the Year 2000 in retail value of the 1916-D Mercury Dime in VG-8 condtion, and the red line charts the Index. The 1916-D is one of the 87 coins used to calculate the Index. As good as the 1916-D dime has been, there are other rare coins that have even done better. The Index is updated monthly.